While divorce is never an easy issue, it’s usually more complex after decades of marriage. Here are a few items in particular that can impact gray divorcees differently from their younger counterparts. If your marriage lasted at least 10 years, you are eligible to receive benefits based on your ex-spouse’s record as long as your ex-spouse is entitled to Social Security and you meet the required qualifications. You must be unmarried, at least age 62, and your own benefit is less than what you would receive based on your ex-spouse’s record. Upon reaching your full retirement age, you are entitled to 50% of your ex’s benefit at their full retirement age. For example, if your ex-spouse is entitled to a monthly payment of $2,000 at his/her full retirement age, you would be eligible to receive $1,000, if you draw at your full retirement age. However, if you find someone to spend your retirement years with and remarry, you are not entitled to draw off your ex-spouse’s record (unless the second marriage also ends). You can also begin drawing the benefit prior to your full retirement age, but it will be a reduced amount. Another consideration: There’s a two-year waiting period after your divorce before you can draw off your former spouse’s benefit. How does your ability to draw Social Security off your ex-spouse’s record impact his/her benefit amount? Not at all. In fact, your ex won’t even know about it. Here’s a tip: If you are negotiating spousal maintenance (which is not uncommon after longer marriages), ask for Social Security statements so you have a clear picture of what your future cash flow might look like. Today, pensions are few and far between. But they aren’t uncommon in the gray divorce world. This joint asset can be a challenge to value and divide, but don’t let that scare you. Each pension plan is different, so there’s no standard set of rules. In general, once you notify the pension plan administrator that your divorce is in process the administrator can then provide documentation of the structure of the plan and any possible options. Your attorney will likely need to draft a Qualified Domestic Relations Order (QDRO) for the pension plan to award you your share. Keep in mind that pension benefits may not be valued in the same way as the other assets you are dividing. 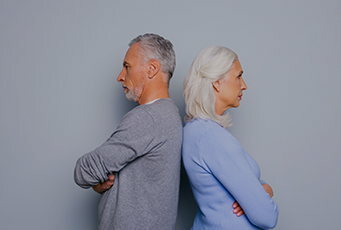 Beyond dividing the pension plan assets, if your former spouse will be receiving pension payments and you expect to be named as a survivor beneficiary, be sure that’s spelled out in your divorce decree. Health insurance is relevant after any divorce, but it can pose additional challenges to older individuals. If, while you were married, you had group health insurance through your spouse’s employer, you can maintain that same health insurance through the Consolidated Omnibus Budget Reconciliation Act (COBRA) for 36 months. Under COBRA, expect premiums to increase, since you must pay the full premium, including any portion that the employer had been paying previously. If COBRA is not available, you must find your own insurance coverage. Unfortunately for gray divorcees, existing health issues may impact their ability to find affordable coverage. Married couples often care for each other if a medical event occurs. However, single individuals will have to find other resources (family, friends, or paid caregivers) to help in the event of a short- or long-term health issue. After a divorce, can you fall back on that joint long-term care insurance policy you purchased? It all depends on the type of policy and the interests of both parties. A traditional policy typically has some flexibility to maintain the policy “as is” or swap for two individual policies. Separating a joint policy to individual policies will likely have an impact on premiums as most policies give a discount to joint policy holders. A hybrid policy may not have those options. Often the contract must remain as written. Due to these nuances, it is important to understand the options prior to purchasing. Long-term care insurance policies are another critical item that gray divorcees should specifically address in their decrees. Retired or approaching-retirement couples who are divorcing have a limited time (or possibly no time) to rebuild their wealth. The assets you had saved to support one household in retirement now need to support two. It’s vital that you understand the implications of your settlement since you likely won’t have a chance for a re-do.